Laie Falls is probably the most common of the hikes for BYUH students, it's close to campus and moderately easy to hike. As with most trails and activites, it's a good idea to go with someone who has done it before and knows trails and turn-offs a bit. Either way here are some directions and advice that might be useful. 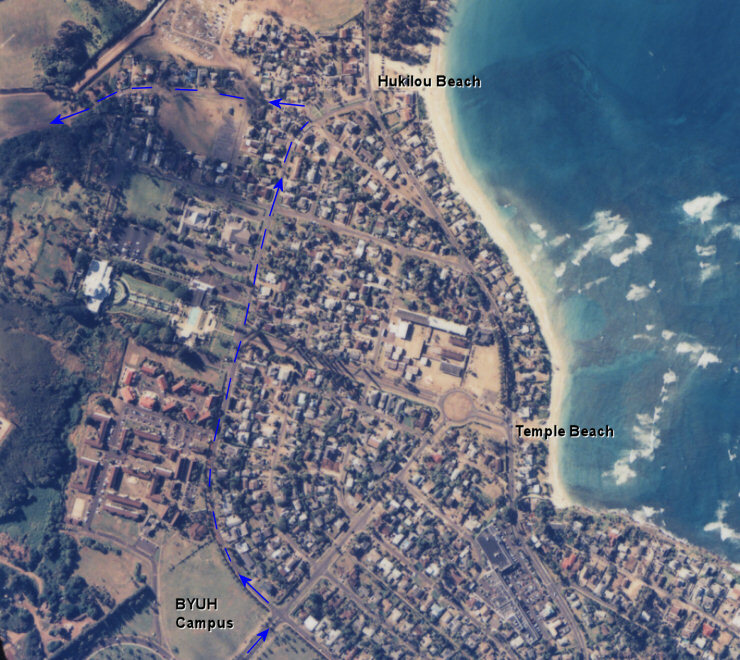 Check the Arial photo at the bottom of the screen for directions from BYUH campus to Poohaili St (across from Hukilou Beach). You will head down Poohaili street for a few minutes until the road splits as in the photo at the left. Keep to the right and go through the gate and down the dirt road for about 6 to 8 minutes until you see a sign and a path at the left of the road as pictured here. The sign gives brief instructions for following the trail and a warning to hikers. The trail is pretty easy to follow from here and if there's any confusion just look for the ribbons (usually pink) that mark the trail. There is one turn off toward the end that is important to take to get to the waterfall. After you go through the Pine Forest you will follow the trail into a thicket for about 15-20 minutes and then the trail will split. It will take a sharp right over a mound and down the ridge toward the river and waterfall. If you continue straight on the trail it goes up the ridge to the summit of the mountain. If there has been some heavy rain earlier in the week then the falls and rapids can be a lot of fun. You can venture downstream a bit to find a rope leading down another waterfall then more rapids and pools. Be cautious though - there's plenty of slipping and falling danger not to mention you have to be fit enough to climb back up and out. Check the Laie Falls photo album to see a few of the watefalls that we identified downstream from Laie Falls. Click here for photographs of this activity (18 photos).